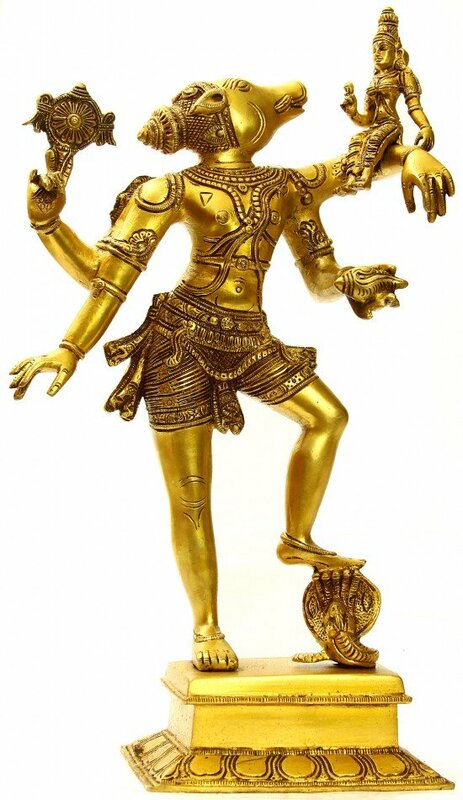 This magnificent gold-like lustrous brass-statue, each part conceived and cast with a jeweler’s precision and minuteness of details, a tall robust figure, the form of boar by face but the rest, a man’s physiognomy, represents Varahavatara : Lord Vishnu in Boar incarnation, carrying Bhudevi, the Earth goddess, over his upper left arm. In scriptural tradition this anthropomorphic form of Vishnu is known as Narvaraha or Nravaraha : man-boar. 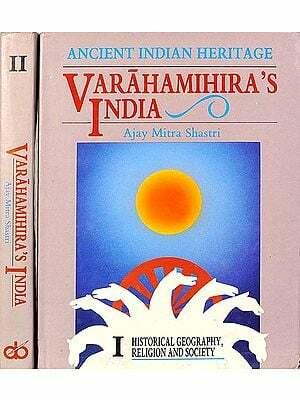 In his main ten incarnations Varahavatara is the third. A tiny form of a five-hooded mythical snake, half human and half viper, paying homage to Varaha with folded hands, holding the deity’s left foot on its hooded head, is a symbolic representation of the great serpent Shesha believed to uphold the earth on its hood and is her custodian, and hence, this expression of gratitude for restoring the goddess to her pristine status. A number of myths perceive goddess Earth as the manifest form of Lakshmi, Lord Vishnu’s consort; other scriptures perceive her as Lord Vishnu’s other consort who he rescues and wins her love and adoration. In either case, Lord Vishnu’s love, especially in his incarnation as Boar, to Bhudevi is apparent, and with his face turned towards the goddess, as also in his emotionally charged figure, this emotional bearing is duly expressed. The incidence of Varahavatara is linked with demon Hiranyaksha, one of the two sons of Diti by sage Kashyapa, other being Hiranyakashipu, the father of Prahlad. The pre-birth accounts of the two brothers are obscure, greater unanimity being with one linking them with Jaya and Vijay, the two arrogant guards of Vishnu in Vaikuntha. As the myth has it, once when sages Sanakadi went to see Vishnu in Vaikuntha Jaya and Vijay not only stopped them from entering the palace gate but also insulted. Infuriated they cursed the arrogant guards to be born on the earth and to get re-entry in Vaikuntha only after Vishnu redeemed them by killing them in three different births. In their first birth the two brothers, Hiranyakashipu and Hiranyaksha, were born as twins to Diti by sage Kashyapa. Extremely powerful, notorious and atrocious, Hiranyaksha sought great delight in torturing gods and holy ones in particular. When unable to confront him, gods fled from Vaikuntha and hid here and there. It enraged Vishnu. He waged a war against Hiranyaksha. The war went on for a long thousand years compelling Hiranyaksha to flee from battlefield. Vishnu chased him wherever he ran. Finally he descended into ‘Patala’ : the mythical nether world under the cosmic oceans, though on his way from Vaikuntha to ‘Patala’ he uprooted the earth from its place and dragged it along to the nether world. For better confronting the demon inside the waters Lord Vishnu incarnated as ‘Maha-Varaha’ – Great Boar, entered the waters and after a long battle killed him. Then, holding on its two tusks the Great Boar brought the earth above the waters and installed it in its place. As usual, among other things the myth deified the earth as the goddess with Bhudevi : Earth goddess, as her name. Characteristically to Vishnu’s iconographic standards, he has been represented with tall, mighty, robust figure. With one of his legs raised upwards as in moving posture, a winner’s bearing on face, swelled breast and the gesture of hands, the lower right and upper left in particular, the figure seems to burst with energy and action. His four-armed form is usual but instead of carrying his regular four attributes he is holding just two, ‘chakra’ – disc, and ‘shankha’ – conch, the other two, lotus and mace are missing. Instead, his lower right hand reveals the gesture of dismissal or putting aside something as insignificant suggesting perhaps that the notice of what is left behind need not be taken. A boar’s face, it has atop a lavish tall Vaishnava crown. His entire figure has been adorned with ornaments appropriate for an image of Vishnu. A mere loincloth comprises his ensemble, however it is most richly embellished and added with waist-ornaments, girdles and others. The tiny figure of Bhudevi, cast pursuing norms of a female figure’s modeling, a tall, delicate and slender build, has been as gracefully bejeweled and attired.